Changing RSS Feed Address in iTunes Podcast Directory? I ordinarily would have just tweeted about this, but it’s a little longer than what I can explain in 140 characters. I hope the SMUG community (and the broader world of what Shel Israel calls Twitterville) can provide the answer. We have some podcasts listed in iTunes, and would like to be able to change the feed address in the directory. We’ve switched to a better way of publishing the podcasts, and also are using Feedburner to enable us to get better statistics. So in essence we want to be able to update our iTunes listing for these podcasts to have the new RSS feed addresses instead of the old ones. We would prefer to not have to create duplicate entries for the podcasts in iTunes, and we want to completely switch over to the new RSS feeds without losing our existing base. We don’t see any way to do this in the iTunes directory. Is it even possible? I had done a quick Google search with the question and got this result; no answer here, either. So I’m turning it into a SMUG research project. Here’s my hypothesis: I’m thinking it may not be possible to update the feed in the iTunes directory because when you subscribe to a podcast feed using iTunes, what really happens is your iTunes goes to the podcast directory and grabs the feed URL. Then when you launch iTunes again, it goes directly from your computer to that feed address to look for any new episodes (without checking back to the iTunes store/directory). So even if you could update the feed in the iTunes directory, your subscribers’ desktop clients wouldn’t be notified. Does that seem like a reasonable explanation? Does anyone really know whether that’s the answer? Has anyone successfully migrated from an older RSS feed to a new one, in iTunes and in other directories? Do you have recommendations on how to do this? This is a new kind of Chancellor RAQ: instead of questions for the Chancellor, these are questions from the Chancellor. I would appreciate any answers the community can provide. And once we get the answer, hopefully we will have definitive guidance that future Googlers will find high in the rankings. Author Lee AasePosted on December 19, 2008 Categories Chancellor RAQs, PodcastingTags Chancellor RAQ, Feed address, feeds, iTunes, podcast, RSS, RSS FeedLeave a comment on Changing RSS Feed Address in iTunes Podcast Directory? I received notice yesterday that my listing of Chancellor Conversations in the iTunes Store Podcast Directory, which I submitted as part of the Podcasting 110 course, was approved. 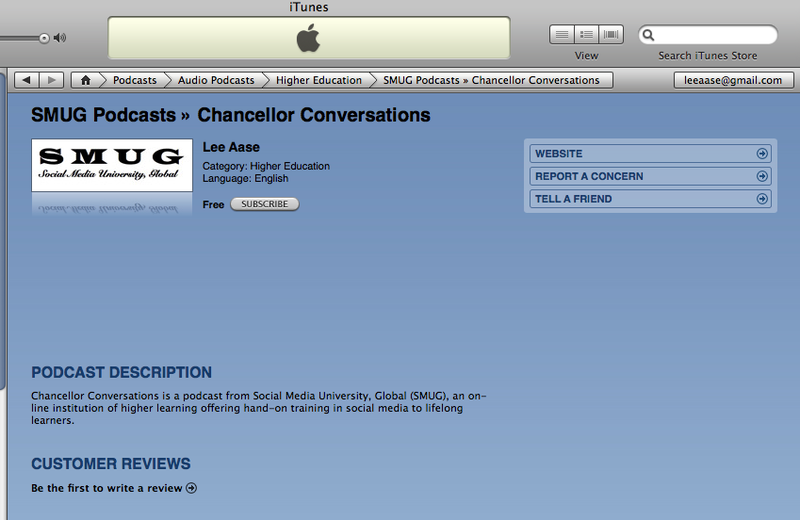 So now, it’s even easier: just click this link to subscribe to Chancellor Conversations in iTunes. I had always wondered how those links worked, in which podcasters put little “Subscribe in iTunes” icons on their pages. Now I know. Apple sends the code, and you just hyperlink from your page. I hope you’ll subscribe in iTunes and continue to learn about social media with me. This is a one-credit course in the Podcasting curriculum for Social Media University, Global. It shows you how to subscribe to the podcast feed you’ve created (or to our guinea pig Toby Palmer’s) using a manual cut-and-paste method. Here’s the slidecast for the course. When you’re done viewing it, see the homework at the bottom. 1. Try clicking this link and see what happens. Then describe what happened in the comments below. 2. Open iTunes, and copy and paste this URL into the “Advanced/Subscribe to Podcast” window as described in the slidecast above.